A portfolio of my peregrines is currently up on the BBC Wildlife Magazine website, featuring some of the images I've been working on for the past 2 years, so I thought I'd take the opportunity to write a bit about the project. My relationship with peregrine falcons has been a long one. I can't remember my very first encounter, but I remember becoming aware of them when I was studying wildlife photography at university in Blackpool. During the term, I'd occasionally see them on the church in the town centre or perched near the top of "The Big One" at Blackpool Pleasure Beach - the world's tallest rollercoaster at the time. Always at a distance, I wasn't sure that I'd ever be able to photograph them. I first witnessed one hunting on a field-trip to Heysham Bay, where 50,000 knot would roost at high tide. Without warning, a large falcon appeared out of the blue and piled into the roosting birds, causing pandemonium. The knot twisted and turned, splitting into aerial spheres of thousands of birds before coalescing into a tight mass, all the while with the peregrine stooping and chasing until it secured a victory. Another memorable encounter was when an adult bird smashed through one of the large double-glazed university windows - presumably unable to pull out of a high speed stoop after a local pigeon. It was a sad sight to see such an electrifying creature suddenly so still and lifeless, but as most of the scientific illustration course's models were getting a bit old and tatty, the college had it stuffed and it became immortalised in ink and paint. During the Summers, I worked on a boat in South Devon that went on wildlife cruises from the Exe out in to Lyme Bay and the Jurassic Coast. We'd see peregrines nearly everyday and this is when I started to get my eye in, and learnt to quickly pick out their shape against a blue sky or a cliff face. Since then, I have always looked out for them in likely spots and in any city that I visit, I watch the pigeons for the tell-tale behaviours that give away a patrolling peregrines's presence in the sky above. But it wasn't until I moved to Bristol in 2010 that I got to know a particular pair of peregrines intimately, learning their daily habits and routines. 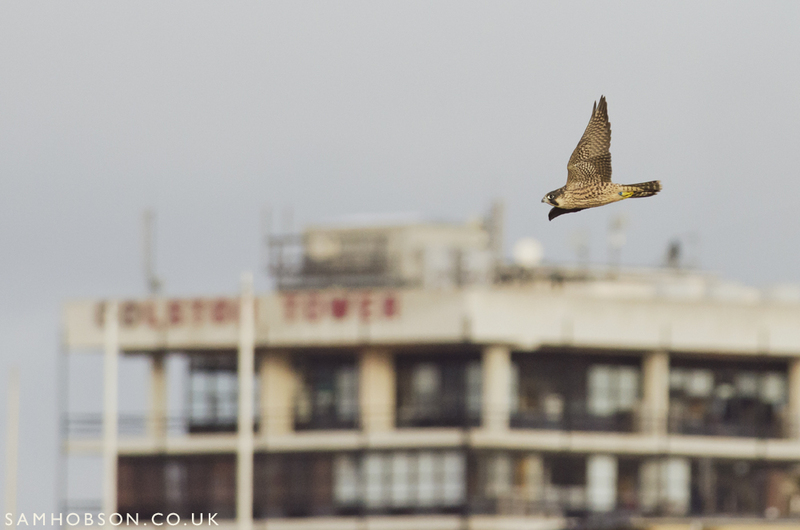 I moved in to a flat in Clifton between the Wills Memorial Building and Cabot Tower, keeping my eye on the Wills Building as it looked perfect for a peregrine. It wasn't long before I was rewarded and I started to see them regularly - I could even hear the occasional screech, kak or ee-chup if I left my window open. On a dark night in November 2011, I stepped out for a walk and could hear the male calling loudly. I'd heard about peregrines using city lights to hunt nocturnally, but I never thought I'd see it for myself. I rushed over to the base of the building and saw a bird in the sky, glowing in the tower's up-lights. It was the female with a kill. It was late, so the streets were quiet, which meant I could run about in the road like a mad-man to try and catch the plucked feathers as they fell. They'd caught a lapwing migrating under the cover of darkness - not a common bird to see in the middle of the city. I was totally blown away. After this encounter, I started to get interested in the urban peregrines' diet - they could show us exactly what unusual birds were flying over our heads while we were tucked up in bed. I began monitoring the Clifton pair and my other local pair in the city centre, and started to discover all kinds of curious goings-on. Whimbrels, woodcocks, cuckoo, golden plover, water rail, little grebe, dunlin, jack snipe, skylark and teal were all on the menu - and none of them city birds. You would think that peregrines living in the city would just prey upon the pigeons, but during some Winter months, pigeons were making up much less than a third of their diet. They were hunting nocturnal migrants almost exclusively. I guess why go after a street-savvy feral pigeon, that knows the city like the back of its wing, when you can pluck a tasty game-bird out of the sky? I realised&nbsp;Bristol was pretty well located for passage migrants - frozen ground or snow cover in the north would push them to the milder south-west. My peregrine watching became a round-the-clock pursuit and I'd take any opportunity to stop in and see what I could find in the prey remains. Some times it would just be a feather or a foot, but occasionally after a storm, I'd find the peregrine's winter cache completely washed out. There'd be wings, legs, whole bodies and one time, even 3 whole woodcocks lying in the street in the centre of Bristol. It's pretty difficult to ID bird remains, even if they are whole - a lifeless lump taken out of context is surprisingly unfamiliar when you don't have behaviour and habitat to help. 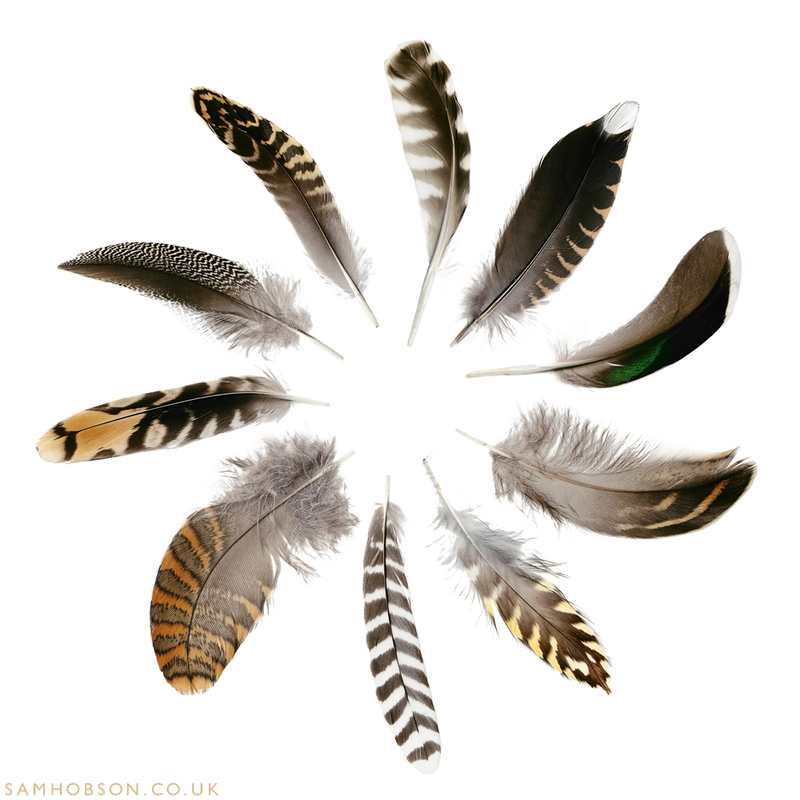 I asked a man well known for his peregrine studies - Ed Drewitt, for help and we became friends, brought together by a morbid fascination for bird bits. He taught me loads, and even though I am now able to identify most of what I find, I still have to go to him with the more unusual stuff. Ed has been studying urban peregrines for the last 15 years and has recently written a book about them, which will feature a lot about their diet and around 20 of my pictures, including this one on the cover - perhaps one of the best looking peregrines out there, the Bristol city centre tiercel. As I spent more and more time learning about the peregrines' habits and behaviours, my pictures started to improve and I started to learn to predict when they would be active and where to be to best see and photograph them. 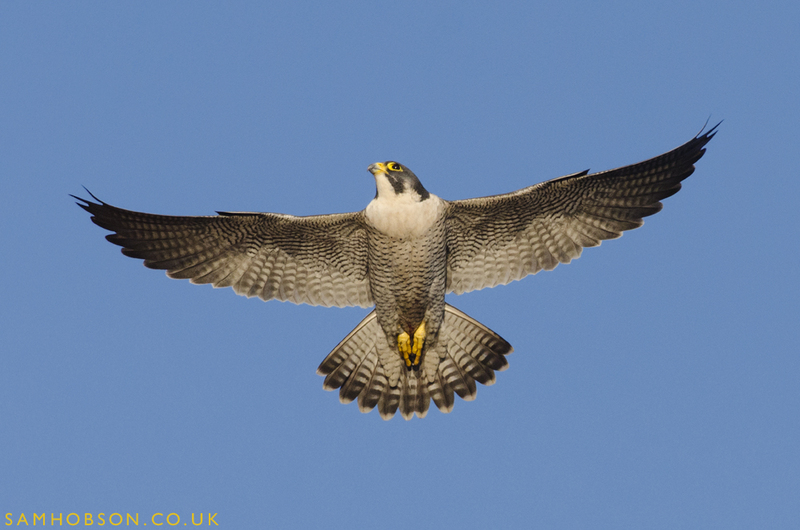 Peregrines might be the fastest animal on the planet, but they can also be the slowest - particularly after a meal. You can literally wait 5 hours for 30 seconds of action, so learning to anticipate their behaviours has been pretty useful, if not for anything else than to save me getting cold and restless. The picture above is a good example - it was a cold Winter's morning, after a period of rain during which this family's food cache had been lost, so I knew they were hungry. The solitary juvenile from that year's brood was still hanging around, begging and being tolerated and I knew the adult male had a sneaky half pigeon stashed away on a different building to their normal cache site. 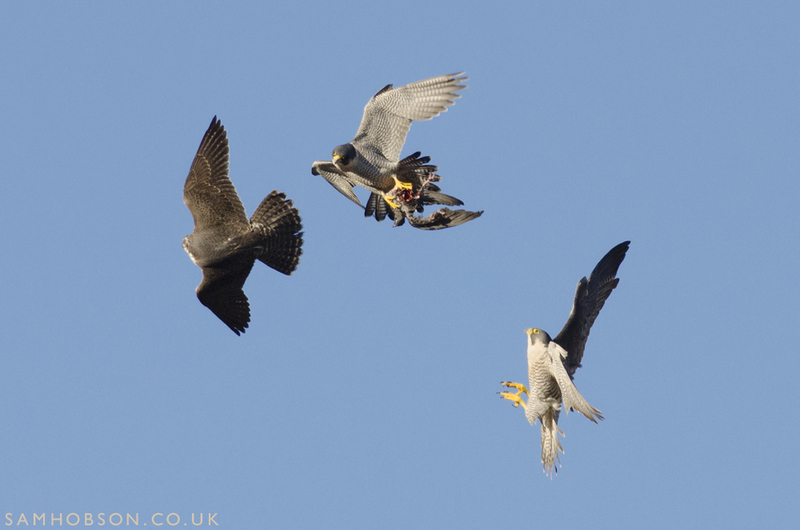 It was only a matter of waiting for him to sneak off and fetch it, which as soon as he did caused the other 2 to chase him until he gave it up - it might look like a food transfer, but in this case, that was the last thing on the tiercel's mind. Below is an image of the same Bristol family - this juvenile male was always playing with his food, and here he's practicing flying whilst carrying the weight of a butchered pigeon. I like the way it shows his tail feathers spread open for extra lift and you can just make out his mother, keeping a watchful eye on him from the building behind. 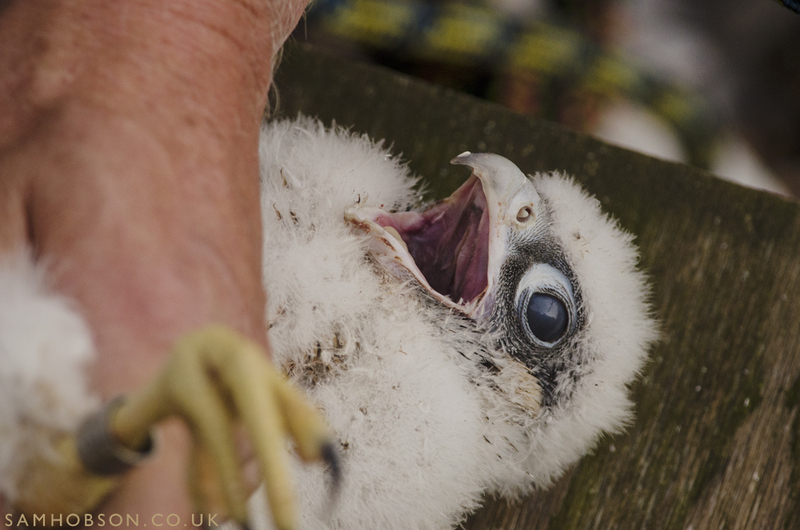 Through working with peregrines, I've had the opportunity to meet and get to know others who share the same passion, which has led to some great photographic opportunities, including ringing the nestlings around Bristol and Bath, again with Ed Drewitt. Probably my most memorable experience though, was watching the peregrines at Charing Cross Hospital being ringed. 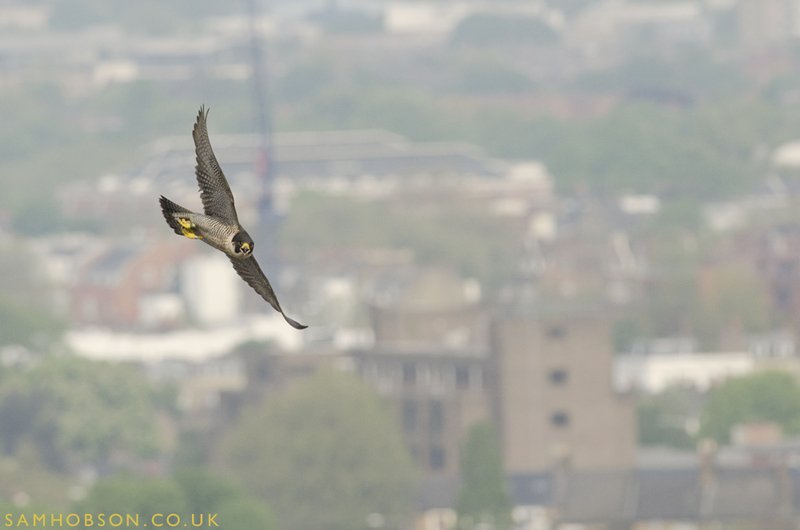 Urban peregrine falcon photography can be tricky as you're always looking up and it's sometimes difficult to get that urban context - a peregrine with a cityscape in the background is like the holy grail! Nathalie Mahieu, who monitors the family there gave me the chance to come along and take some pictures during the ringing. I was pretty excited, as we'd be up near the top of the hospital, looking out over a busy London skyline. That morning the sun had just started to peek through the clouds as we went up towards the roof to access the scrape and by the time we got up there, there was just enough light to get the shutter speeds I'd need to capture the birds in flight. You never know how the parents will react when the chicks are being ringed. Sometimes they will just disappear, occasionally they will react at first, then settle down and watch from a distance - particularly if they have had their chicks ringed before, and sometimes they will remain vigilant and agitated - flying backwards and forwards, calling as they closely watch the proceedings. After about 15 minutes the whole thing is over and it's as if nothing ever happened, but those 15 minutes can be pretty productive if you can hold your nerve and not panic when there's an adult peregrine falcon buzzing past just metres from your head. 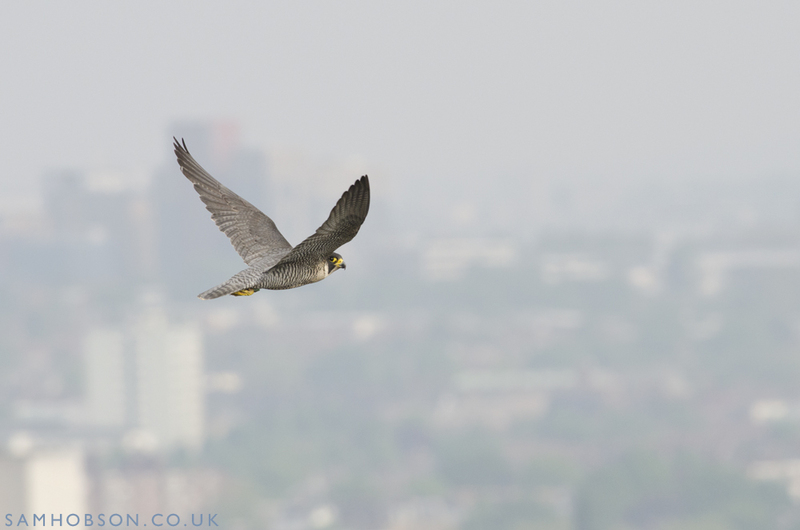 You can see more from my urban peregrine project on my portfolio site. Ed's book is out in May, and can be pre-ordered at the Natural History Book Store. 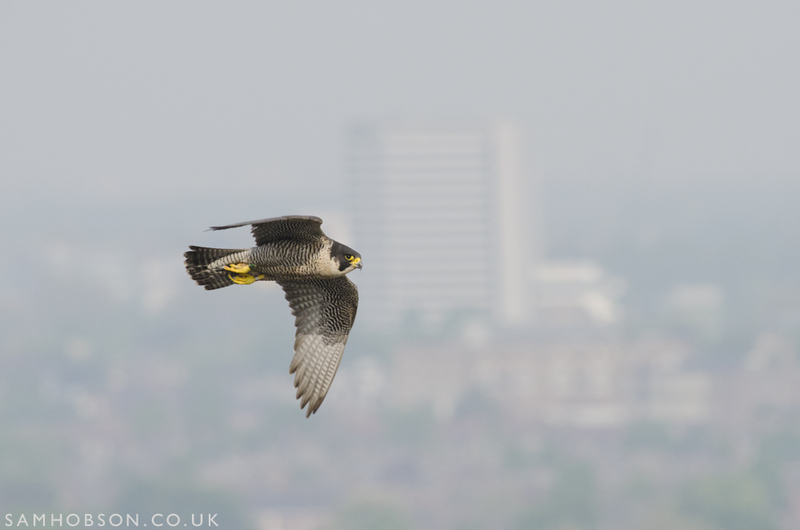 I'd like to thank fellow peregrine people - Ed Drewitt, Nathalie Mahieu, Terry Pickford, Stuart Harrington and Dave Morrison for their help and advice and fellow photographer Bertie G for keeping me on my toes with his many exclamations of "urban peregrine, comin' in hot!!! "..